A copy of this book was provided by the author in exchange for my review. 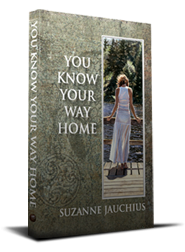 You Know Your Way Home is Suzanne Jauchius' memoir highlighting the struggles she faced throughout her life. To begin with, Suzanne had a very rough childhood. Couple this with the psychic gift of "seeing", and it is no wonder that she spent most of her adult life trying to find acceptance. Unfortunately, as every good psychologist will tell you, you first have to accept yourself. A lesson it took Suzanne a very long time to come to grips with. Through her 5 marriages and many ups and downs, it was she who most needed to accept herself and her gift. Once that was accomplished, she could begin to live a successful life. The phenomena of the psychic is a subject that fascinates me, not the least because it is so controversial and so hard to prove or disprove. I think that was the main reason that I was drawn to this book. I never tire of hearing the stories of people who have had brushes with their sixth sense. Straight out memoirs, though, are not something that I am usually drawn to unless I am familiar with, or curious about, the person whose story is being told. In the case of You Know Your Way Home, what interested me was the fact that Suzanne is a practicing psychic and has participated in a few high profile missing person cases. Although I liked the portions of the book where Suzanne talked about this, there were too few of them in my opinion. The focus in this book is really more about the struggle that Suzanne dealt with. How it manifested itself throughout her life, how the people in her life either helped or hindered her development, and how she eventually was able to pull her life together and become more successful. As such, it read a bit more like a self help book than a memoir to me. For me, so much of the book was centered on the negative parts of Suzanne's life,that the writing actually came across as whiny. By the time she got to the part where she learned to accept herself, and therefore was able to improve her life, I found it hard to be uplifted. Although this book was a fast read, and was reasonably well written, there was just too much focus on the negative for me to really become invested in it. There were so many things that Suzanne alluded to, but never really covered, that seemed much more interesting to me. For example, I would love to read Suzanne's case book, hear more about her "conversations" with her friend Bob, read more about her family history and the grandma's and aunts that had similar gifts. Even the life of the "brash mystery man" and his Lakota friends would have been nice to know more about. As a result, this was a 3.5 star read for me.